BEING born without fingers can be tough for any child. Getting new ones, especially red and blue superhero themed digits, has made 8-year-old Kaori Misue a vibrant playground star. 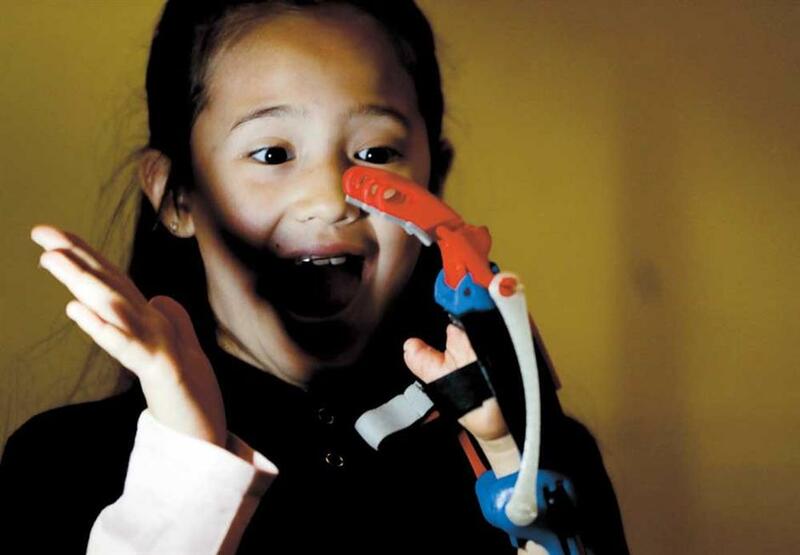 Kaori Misue breaks into a smile in Buenos Aires, Argentina, as she has a brand new prosthetic hand thanks to the genius, 21-year-old inventor Gino Tubaro and his 3D printer. Today, more than 500 people, mostly children, have received similar prostheses and 4,500 more remain on a waiting list. Flexing her wrist muscles to bend the plastic fingers, she can work with tape and stickers in an arts and crafts class. She can ride a bike, skip a rope and bake pastries with her mom. Her amazed friends have even begged to borrow the 3D printed hand, which looks like she has a Transformers toy strapped to her wrist. Hundreds of Argentine kids like Kaori, who were born without limbs, are now able to write, play sports and make music thanks to low-cost prosthetic hands devised by Gino Tubaro, a 21-year-old inventor whose work was praised by former US President Barack Obama during a visit to Argentina last year. Tubaro’s “Limbs” project is part of a trend of open-source 3D printing technology initiatives around the world. They include the nonprofit e-NABLE organization that groups volunteers to provide hands and arms to those born with missing limbs or who lost them to war, disease or natural disaster, and the Build It Workspace studio, which teaches people how to use high-tech printers. Growing up, Tubaro remembers breaking apart home appliances to try to turn them into new inventions. Instead of reprimanding him, his parents signed him up to a weekend workshop where he had free range to experiment. Along the way, he began earning awards for his designs. The project uses volunteers around the world who own 3D printers to print the pieces and assemble and deliver the hands. They can cost as little as US$15 compared to sophisticated designs that are priced up to US$15,000. Some of the pieces can be interchanged to fit a specific purpose: from playing pingpong, grabbing a fork or riding a bike. If children outgrow a model, it can be easily replaced, with a different theme. A black Batman design can hurl plastic disks. A red and gold Iron Man version can shoot rubber bands. “It’s a wonderful experience because we’re getting photos of kids using the prostheses in Thailand, Mexico, Egypt ... doing things that they couldn’t do before,” Tubaro said about the project, which is partly financed by donations and award money. Kaori wanted a light blue-and-white Princess Elsa model, but since they ran out of those, she got a bright blue and red one that matches with her outfits. The walls of Tubaro’s Atomic Lab workshop in Buenos Aires are decorated with printed drawings of hands by Leonardo da Vinci next to designs for Iron Man robotic hands. Microwave-size 3D printers are stacked on wooden tables next to containers filled with plastic for prosthetic hands. On a recent day, Tubaro answered emails and phone calls while he slurped noodles and finished printing a new prosthesis for a jazz trumpeter. “Thanks to the prosthesis, I can communicate with my instrument much better. It’s a total joy,” said Juan Pablo Pelaez, 33, who lost his arm in a car accident at age 14.